I thought I had eight more weeks to train for the Brooklyn Half, but I discovered this morning that I'd mistakenly added an extra week into the schedule. I'm glad that I noticed this before it created a disruption with my plan. I had originally built in two 11 mile Sunday runs prior to my final 12 miles the weekend before the race. I needed to eliminate one of them to make the schedule work. I have two consecutive 10's before that and could have reduced that to one. However, I think I'm better off going 10, 10, 11 and 12, especially with the extra long runs midweek. I had early plans today, but was still able to get today's base run done by mid-morning. Rain was threatening, so I decided to forgo Bethpage in favor of my local streets. I really dislike running in the rain and was concerned about getting caught in a downpour. 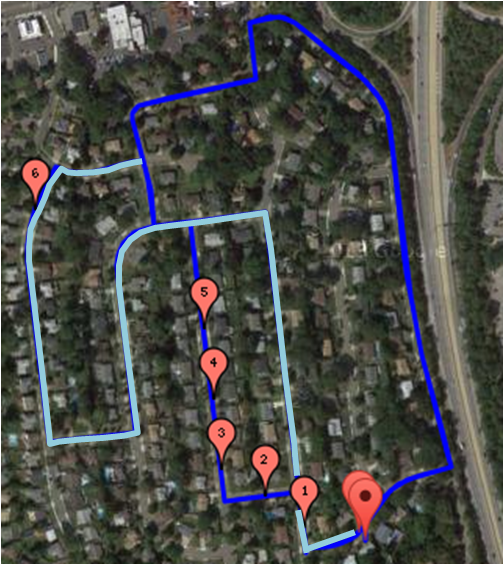 I came up with the idea of running a set lap of roads that are close by my house. I figured, no matter how hard it might rain, I'd never be more than half a mile away. The thought of running the same one-mile loop 6-plus times wasn't appealing, but it was a practical approach. Coming into this weekend, my batting average for good Sunday training runs was .000. The last two week's efforts resulted in difficult and demoralizing performances. I suspected the very cold temperatures on those days were the reason, and anecdotal evidence supported that. I had a miserable five mile run on Wednesday, but much of that can be blamed on the freezing winds. Today's temperature was over 40°, even with wind chill. I felt more comfortable as a result. I was prepared for a tedious experience running the same loop over and over, but it turned out to be fine. The route I designed began with a moderate uphill section that lasted for the first half mile. The only negative about that part was the noticeable wind that made progress somewhat more challenging. Once I got past the incline, I had a reciprocal downhill almost back to my starting point. It never rained, but a constant mist coated my glasses and required me to occasionally clear the lenses while I ran. Not a big problem. I started slowly and that really helped. I tend to start too quickly on long runs and it sometimes accelerates fatigue. Today I maintained a steady stride all throughout the run. I was happily surprised to find my energy level increasing midway through my fifth mile (ketosis?). I was on the fence about whether I'd complete a full seven or cap the run at six. The lap I had charted was actually 1.05 miles, so I knew I'd get to 6.3 by default. I decided to go off route halfway through what would have been my sixth mile and added some distance. That ended up increasing my total by almost half a mile, not quite bringing me to 7. With the addition of an extra two miles on Wednesday's run (compared to the Higdon plan), I was fine with that. Next Tuesday I'll attempt 6 x 400's outdoors and aim for 5.4 miles on Wednesday. 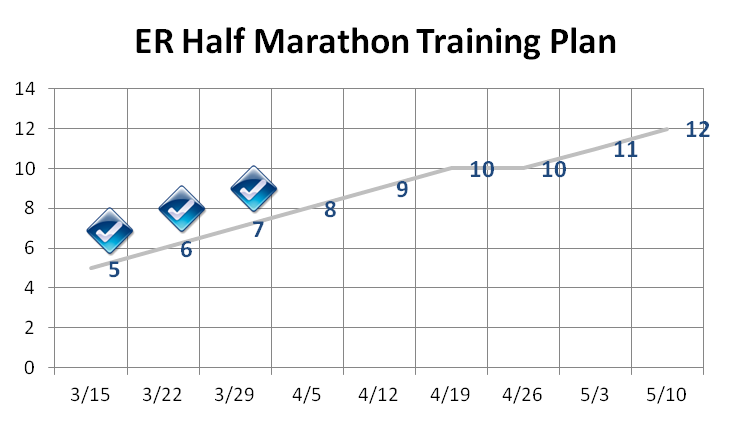 Next Sunday the long run total jumps to eight. With a trouble free, almost-seven run under my belt today, I'm feeling much better about my training. Good for you! I think that run would drive me crazy, but you seemed to fly through it. Why 5.4 next Wednesday? Why not 6? I took your suggestion about adding a mid-week longer run, so I'm doing 80% of the distance of my previous Sunday's run. 6.75 x .8 = 5.4. Although I sometimes end up going longer than planned and could end up running 6 after all. That's an interesting way of doing it. *SIgh* - So many different ways to eat and train.. so little time.. I'm not sure if I should back off on the midweek mileage a little. As long as I do those runs easy, I think it will be fine..